Place a sieve over a dry bowl and add milk powder and cocoa powder. Sift the powders together twice so that they get mixed up well. Take a flat rectangular tray and add ghee to it. Smear the ghee with fingers and coat the entire base of the tray. Heat a thick bottomed pan. Add sugar and water to the pan. Cook the contents in the pan on high flame, stirring, till all the sugar is dissolved and bubbles appear. Then lower the flame and cook stirring in between till the syrup reaches one-thread consistency. When the reading on a candy thermometer shows 110oC the syrup reaches one-thread consistency. Syrup when stretched between thumb and index fingers should get one-thread. Then add unsalted butter and mix well. Cook till butter melts. Then add milk powder & cocoa powder mixture. Mix well while cooking on low flame. Once all dry ingredients get mixed with the wet ingredients the mixture will look like a smooth chocolate batter. Further cook on low flame for 2 minutes stirring all the while. After 2 minutes transfer the chocolate to the prepared tray and spread evenly. Cool the chocolate to room temperature. Take a knife and cut the chocolate to desired shapes. Turn the tray on to a dry plate to separate the chocolate pieces. As the chocolate is soft, take care while removing the pieces. It is advisable to pick each piece and keep it separately in the plate. Delicious home-made chocolate is ready to serve. Though I have given the measurements in cups also, it is advisable to measure in weights for better results. Use dairy whitener to get soft chocolate. When sieved together, the milk powder and cocoa powder mixes well. Sieve the powders twice. Once the sugar dissolves and the liquid starts boiling (when bubbles appear) lower the flame. From this stage cook on low flame only. In order to get the single thread consistency fast, do not cook on high flame. Cook on low flame stirring in between till syrup reaches one-thread consistency. It is easy to check the consistency of syrup on a candy thermometer. When temperature reaches 110oC, the syrup reaches one-thread consistency. After mixing the dry ingredients with the wet ingredients, the chocolate will be ready—but—the mixture will be grainy to taste. So, after mixing the wet and dry ingredients properly, cook on low flame for further 2 minutes till the chocolate is soft. Cool completely before cutting the chocolate to pieces. This home-made chocolate just melts in mouth and is enjoyed by all age groups. My mom and I love your youtube page! We spent a long time looking at it and we decided to make the fudge!! i came across many cooking websites, but yours is really wonderful. saw your feedback on ppl comments in YT. those ppl dont have anyother generous work than leaving a bad comment on good works too. mee recipes anni baga unnai. am proud to be a telugu ammai. 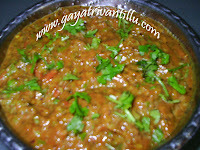 me vantalu chala baguntai,naku home made chocolate prepare cheyadaniki cocoa powder ekada dorukutundo chepagalara please. Try in Super Markets in the food section. 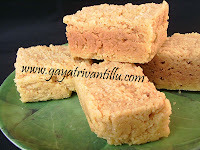 Hi Gayatri garu, I prepared the 'home-made chocolate' yesterday and it turned up very good. As I was a little scared at the outcome, I prepard it with quarter measurements. I followed your instructions/narration to the dot and the chocolate came out very well. My 2yr old had his first taste of chocolate yesterday and kept asking for 'tum mo'(he cannot say "some more" clearly). Next time I plan to add some cashew/almond/raisins to make it 'home made fruit n nut chocolate'! Chocolate has a tendency to bring in constipation. Therefore give it in measured quantities to the child. Convey my love to the little one. i tried your recipe 'homemade chocolate'. it turned out really well. thanks for the recipe. 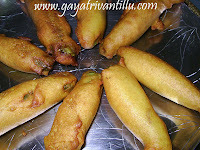 please post recipe for 'curd vada'. I am a telugu boy aged 12 years old. I have watched many of your videos and am inspired. I like your food and especially the home made chocolate. This is regarding "Home made Chocolate". It turned out like a burfi/mithai. Actually after the one thread syrup i added all ingredients it was all dry. It never turned out like a paste. Then immeidately i sprinkled water then it got to paste, later it was too hard. Not smooth like the picture shown. It was tasting more like a burfi. Probably i had put some more cocoa. Please let me know where was the mistake.